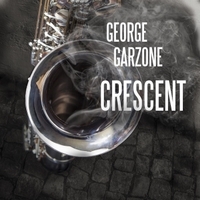 George Garzone is a musician’s musician, renowned as both a tenor saxophonist and an educator. But he remains relatively little known to the wider listening public. Perhaps his new album with two of his former Berklee students, much-celebrated bassist and vocalist Esperanza Spalding and her frequent keyboardist Leo Genovese, will help change that. The emphasis here is on musicianship more than originality. Half of the eight tunes on Crescent are skillful interpretations of standards: Dave Brubeck’s “In Your Own Sweet Way,” Jimmy Van Heusen’s “Like Someone in Love,” Billy Eckstine’s “I Want to Talk About You” and Fred Lacey’s “Theme for Ernie”—each of which Garzone lodestar John Coltrane recorded on one late ’50s album or another, whether his own or as a sideman with Miles Davis. The title track itself is an emotive cover of one of Coltrane’s compositions, and demonstrates the freer leanings Garzone harnesses in his longstanding Boston-based trio the Fringe. But the other covers play up his and his bandmates’ considerable straight-ahead and balladic strengths. Garzone contributes two compositions, one of which, “The Girl From Argentina,” gets a shorter second take aimed at radio play. The tune’s slow, pretty vibe is obviously inspired by “The Girl From Ipanema,” a hit for another Garzone tenor sax hero, Stan Getz; both versions of Garzone’s tune feature wordless vocals from Spalding and the Argentine pianist, and lush tenor and piano solos. Garzone’s “Hey Open Up,” the disc’s freshest, most modern piece, has a casually uptempo, postmodern swagger to it that calls to mind his friend and occasional collaborator Joe Lovano. Spalding’s unaccompanied solo, a walking line interrupted periodically by melodic asides, becomes a duet as Genovese joins her for his solo. The pair then comps for Garzone as he takes his rightful place in the spotlight. There is no greater paragon of tenor saxophonist taste than Harry Allen. While the fickle winds of prevailing styles continue to blow this or that way, Allen stands tall like the mighty oak, unswayed by fad fashions and firmly rooted to the music of the Great American Songbook. 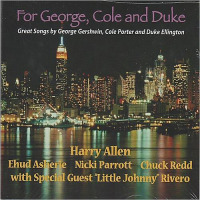 On this appealing date, Allen visits the music of George Gershwin, Cole Porter, and Duke Ellington. It's not a novel concept, and Allen has gone here countless times, both with single song nods to these men and, on at least two occasions, album-length tributes—Cole Porter Songs (BMG, 2001) and Plays Ellington Songs (RCA Victor/RCA, 2000). But does that really matter? Allen continues to find inspiration in the work of these masters—men whose respective compositional wells never run dry—and his interpretations of their music are things of beauty. You could even go so far as to call them gifts to the ears. For George, Cole, and Duke finds Allen working with a classy crew of like-minded traditionalists. Pianist Ehud Asherie delivers twinkling and sparkling solos, light and comforting comping, and beautiful beds of sound; Nicki Parrott provides balmy vocals ("In A Mellow Tone," "How Long Has This Been Going On?," and "Mood Indigo"), pleasing solos, and sturdy walking bass lines that act as the heartbeat of this music; and Chuck Redd proves to be a master of feel and economy whether providing a cheery swing pulse from behind the kit or gliding over his band mates with his vibes ("Who Cares?). The majority of the album is a quartet affair, pairing those three with Allen's attractive tenor, but percussionist "Little Johnny" Rivero drops in for the occasional guest shot, adding Latin seasonings to lively numbers ("Love For Sale") and slow roaming episodes of Ellingtonia ("Mood Indigo"). Harry Allen isn't likely to win any originality contests with this one, but that doesn't seem to bother him, nor should it. He's got his sublime saxophone, a group of top-notch musicians, and the music of the masters to work with. In this case, and throughout his career, that's proven to be a formula for success. Always True To You In My Own Fashion; In A Mellow Tone; Happy Reunion; Silk Stockings; Purple Gazelle; How Long Has This Been Going On? ; I Love You Samantha; Shall We Dance? ; By Strauss; Love For Sale; They All Laughed; Who Cares? (So Long As You Care For Me); Mood Indigo. Harry Allen: tenor saxophone; Ehud Asherie: piano; Nicki Parrott: acoustic bass, vocals; Chuck Redd: drums, vibraphone; "Little Johnny" Rivero: shakere, conga, bongo (5, 10, 13). 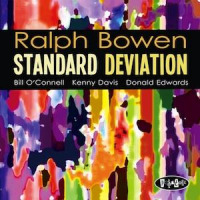 Tenor saxophonist Ralph Bowen (Out Of The Blue, Horace Silver, Michel Camillo) is a highly regarded New York-based artiste and an idea man who can stand with the best of them. With his fifth solo venture for Posi- Tone Records Bowen tackles standards, and as the title intimates, he often deviates from the norm. Jerome Kern's "Yesterdays" receives a Latin uplift, sparked by venerable pianist Bill O'Connell's topsy-turvy opening statements and bristling unison choruses with the rhythm section. From this point onward, they spring into a buoyant romp as Bowen stokes the coals via a ferocious series of choruses. He adds enough bite to impart a distinct edge, yet interweaves his melodic flair into ultra-fluid lines and improvises within the lower to medium registers. But he doesn't waste any notes and injects a few emphatic honks and squeaks into the upper-registers to raise the pitch with a stirring climatic assault while also infusing brevity into O' Connell's flavorful arrangement. Ultimately, Bowen and his first-class ensemble ruffle a few feathers and take matters into their own hands by not tendering literal readings of these rather shopworn works. (Zealously recommended...). Ralph Bowen: tenor saxophone; Bill O’Connell: piano; Kenny Davis: bass; Donald Edwards: drums. Harpo's Blues; Happy To Be; Our Love Rolls On; You're The Dangerous Type; Corcovado; I Have The Feeling I've Been Here Before; The Blues According To Orpheus; I Wish I Could Go Traveling Again; I Never Went Away; High In The Sky; For Joni. Julie Kelly: vocals; Bill Cunliffe: piano, synthesizer; Anthony Wilson: guitar; Tom Warrington: bass; Joe LaBarbera: drums; Walter Rodriguez: percussion; Bob Sheppard: saxophone, flute; Clay Jenkins: trumpet; Ron Stout: flugelhorn; Bob McChesney: trombone; Kim Richmond: saxophone; Nick Mancini: vibraphone. Since the late '80s vibraphonist Joe Locke, an artist who defies categorization, has performed and recorded with a diverse array of musicians, including Eddie Henderson, Cecil Taylor, and The Beastie Boys. Love Is A Pendulum, his fourth release on the Harlem-based Motema label, features some of Locke's most compelling music to date, the centerpiece of which is a five movement suite based on a poem by musician and writer Barbara Sfraga. Culled from Sfraga's Subway Series, Locke explains in the liner notes that "Each verse begins with a metaphor describing love—its properties and tendencies—and how (possibly) to navigate them." Far from a one-sided affair, the suite encompasses a wide range of emotions, keenly interpreted by Locke's highly responsive working quartet with pianist Robert Rodriguez, bassist Ricky Rodriguez, and drummer Terreon Gully, who are subsequently joined by occasional guests, including alto and soprano saxophonist Rosario Giuliani, tenor saxophonist Donny McCaslin, guitarist Paul Bollenback, steel pan virtuoso Victor Provost and vocalist Theo Bleckmann. The through-composed fanfare "Variation On Wisdom" introduces the suite in magisterial fashion, setting the stage for "Love Is The Tide," which emulates surging power through ebbing rhythms and fluid solos, whereas "Love Is A Planchette" features Bleckmann's ethereal vocalese floating spectrally, like a planchette across a ouija board. The episodic title track and the rubato ballad "Love Is Letting Go" similarly explore myriad moods, while the climactic final movement, "Love Is Perpetual Motion," opens with a series of heated alto and tenor exchanges between Giuliani and McCaslin before spotlighting the beguiling kaleidoscopic interplay of vibes and steel pan. The album concludes with three compositions that are stylistically comparable to the main program: the tunefully introspective dedication "For Jesse Mountain"; a blazing hard-bop work-out on "Last Ditch Wisdom"; and "Embrace," based on George Gershwin's "Embraceable You," which was conceived by Locke as a vehicle for Provost's melodic ingenuity. The quartet's intuitive rapport and the invited guests' spontaneous contributions impart soulful verve to Locke's written notation, collectively bringing the leader's multifaceted charts to life. 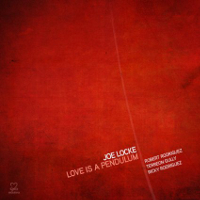 One of the most ambitious efforts in Locke's discography, Love Is A Pendulum is a captivating example of today's finest creative mainstream jazz. Variation On Wisdom; Love Is The Tide; Love Is A Planchette; Love Is A Pendulum; Love Is Letting Go; Love Is Perpetual Motion; For Jesse Mountain; Last Ditch Wisdom; Embrace. Joe Locke: vibes; Robert Rodriguez: piano; Terreon Gully: drums; Ricky Rodriguez: acoustic and electric bass; Rosario Giuliani: alto saxophone (2, 5-8) and soprano saxophone (4); Donny McCaslin: tenor saxophone (6, 7); Victor Provost: steel pan (6, 9); Theo Bleckmann: voice (3); Paul Bollenback: guitar (1, 7).